Still some spillover from last week’s intensity, but it’s okay to take a break if you need one. Let’s get to it. LEFT: SEVEN OF WANDS. As mentioned earlier, there’s still going to be some tensions from the previous week. The need to assert yourself will be paramount for some. Stand up for what you believe in, and don’t give in to fear. 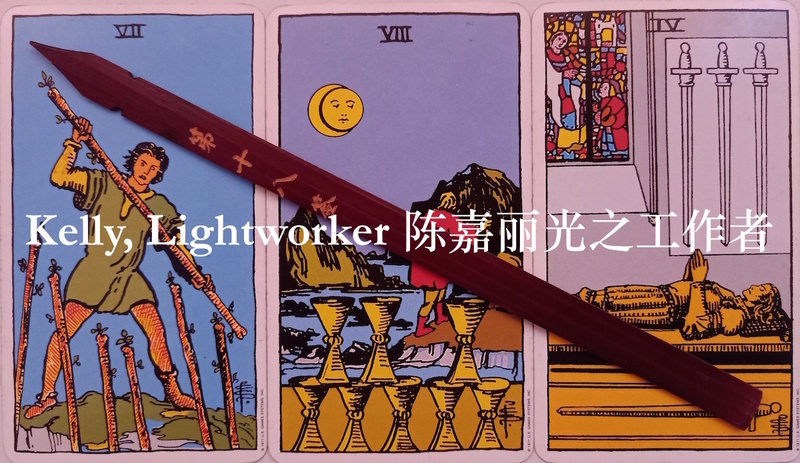 Notice the six assailants wield their wands threateningly against the man depicted in the card, but none of their faces can be seen – this can indicate hidden enemies, or (more likely) the fact that many of your fears are self-inflicted. MIDDLE: EIGHT OF CUPS. This card depicts a hooded figure walking away, and usually signifies the need to choose the path that fulfils a higher purpose and the greatest good. You could be walking away from old patterns, habits, relationships, and dynamics that you no longer resonate with – that’s wonderful, and even if you’re feeling a little lonely or confused at the moment, you will be alright in the end. The Eight of Cups can symbolise travel – if you’re planning a trip this week, or even just making plans for a trip in the future, good for you. Energies are conducive for safe movement. RIGHT: FOUR OF SWORDS. For many of us, I believe a time-out is in order. This card is here to remind you not to over-think, and to take a rest because you’re probably more mentally exhausted than you realise. If you’ve been running on empty or cruising on autopilot for a while now, this card is definitely for you. There’s no shame in taking a day off (I’m looking at you, workaholics and perfectionists) when you need to rest, relax, and recharge. A spa session, meditation in the park, a long walk down your neighbourhood… whatever it takes to get you out of the rut, do it. So the cycle of day and night has turned since the days of old. Whoever you are, this is the order of things. To everything, there is a season. YOUR SEASON IS COMING TO FRUITION NOW. What you have planned and hoped for will come to you soon, inevitably, as surely as the Sun sets in the West and the Moon rises in the East. Get your affairs in order: major change is imminent. When things fall into place, as they certainly will, act quickly and efficiently. Your desired outcomes will manifest soon, so take advantage of the time. And if you’ve already done all that you can, and you’re still standing firm, good for you. Dear soul, lay down your arms; entrust your situation to Heaven in prayer, and trust the Divine to carry you through. What is meant for you will never go past you. What is yours will always find its way to you. All in the right time. Trust.